Back to the Future is a classic movie. It is one of the most immaculately constructed movie ever made. Everything that is set up in the movie has a pay off by the end. It is filled to the brim with clever jokes and things happening in the background that you can pick up on in future viewings. Having said all that, Back to the Future Part II has always been my favorite of the trilogy. Back to the Future Part II is an example of what a good sequel can be. It continues with what you like about the original, but progresses the story forward. The fact that it is not just a loosely veiled remake of the original is worthy of respect by itself. That there would be a sequel to Back to the Future was not in doubt since the first was incredibly successful, but there was never intended to be one. The ending of Back to the Future was meant to be simply a fun scene to end the movie on, but when it came time for the sequel to be made, the ending of the original became an albatross that would dictate the direction of the sequel. The first movie ended with Doc Brown showing back up in the DeLorean and taking Marty and Jennifer with him to the future to save their children. It’s a fun ending, giving the sense that Marty and Doc would have more adventures in the future without having to show them. The problem with the ending is that any sequel made would have to deal with it. Forced to continue where the original ended exposes flaws in the logic of the movie. 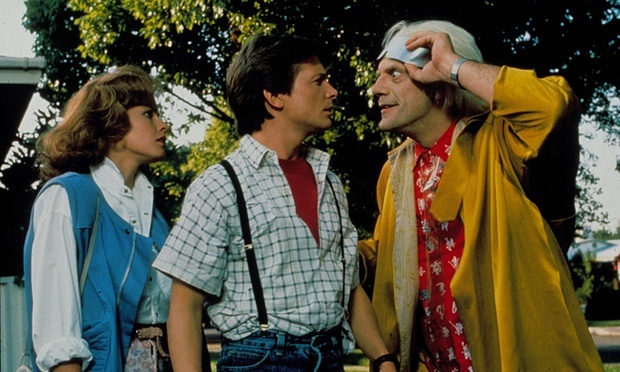 Doc Brown doesn’t want to affect history, but he’s A-OK messing with the future? Why is it such a pressing matter that must be dealt with now? Jennifer goes along for no apparent reason, which is odd, because, in a confusing scene, Doc Brown tells Marty she can’t know too much about her own future. Then why take her along in the first place? All of this is dictated because they wrote themselves into a corner by the ending of the first movie. The director, Robert Zemeckis admitted that if they could do it over again, they would have left Jennifer in 1985, rather than dragging her along. It is pretty obvious that she wasn’t wanted in the movie. She gets knocked out by Doc Brown minutes into the movie, dumped near garbage (! ), wakes up, then faints minutes later, and is dropped off on a swing, never to be seen again in the movie. A smart decision on the part of the filmmakers was to not try to predict the future, and just let the sky be the limit. Knowing that whatever they would put in the future wouldn’t end up being accurate, they decided not to bother. This led to many different funny jokes and sight gags. Almost too much, in my opinion. While comedy existed in the original, it was more situational and character related. What I’m trying to say is, was it really necessary to have Michael J. Fox play his own daughter? There is a real sense of humor in the future setting which places it at odds with the more dark tone later in the movie. I would actually argue that the “future” portion of the movie is the weakest section of the movie. Not everything is wrong with the opening, however. Visually it is gorgeous. Freed from trying to fit in with reality allowed Zemeckis and company to go big with ideas and visuals. I remember being wowed by the technology, particularly the self-tying shoelaces, and like most people, the hover board. 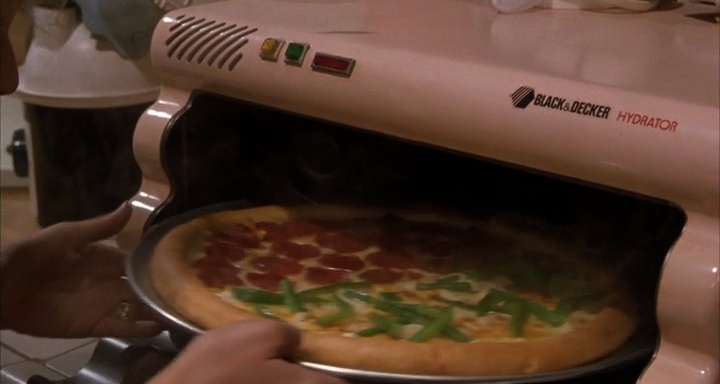 The thing that blew my mind was the small pizza that you put in a hydrator and became full-sized, I don’t even know how feasible idea that is, but Pizza Hut should get on that ASAP. What I really like about this movie is its unpredictability. Generally, sequels try to imitate the rhythms of the original, so as to not put off fans of the original. As a result we get sequels like Home Alone 2, that is basically a point by point rehash of the original with cosmetic differences. In this one, the movie takes a few turns that really surprised me watching for the first time. This does not come without its own set of drawbacks. You can feel the strings being pulled in the plot early. There’s no way old Biff could possibly know how to operate the DeLorean in the time the scene where he steals it takes place in. But I can forgive the string pulling if the result is worth it. In this case, it was. The second act is where the movie really gets going for me. It is incredibly disorienting to watch because we are given little information. 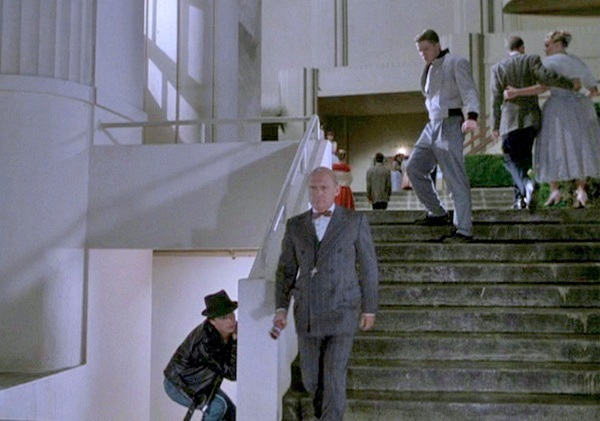 It is not until Doc literally gets out a chalkboard and lays out what’s happening, that the plot comes into focus, but until then we get awesome bits like Strickland shooting at slackers with a shotgun, or the rise to power of Biff as shown in the video playing outside the casino. The movie gets pretty dark here, no where in the original is a gun used, but here Marty is in real danger of being killed. I must praise Thomas F. Wilson’s performance in this movie. Christopher Lloyd and Michael J.Fox get the lions share of praise, and it is richly deserved, but this is in many ways Biff’s movie. Wilson gives 5 different performances in this movie: the humbled Biff from the original 1985, old Biff from 2015, Biff’s son Griff, mogul Biff from the alternate 1985, and original Biff from 1955. Each one is hilarious in their own way, although my favorite is the alternate 1985 Biff. He still seems like Biff underneath, but there is something darker about him that differentiates him from his other versions. The final act brings it all home and is my favorite portion of the movie. 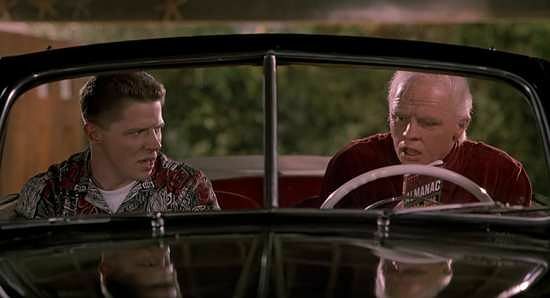 Originally the idea was to have Biff go back to the 60s to deliver the Almanac and when Marty goes back he inadvertently puts his conception in danger, which is a complete rehash of the original. Thankfully, Zemeckis saw this and decided to just go back to the original movie again. This is an idea I love. Taking the notion that all sequels are just the originals all over again and making it literally true. This is where the complexity of the story pays off. 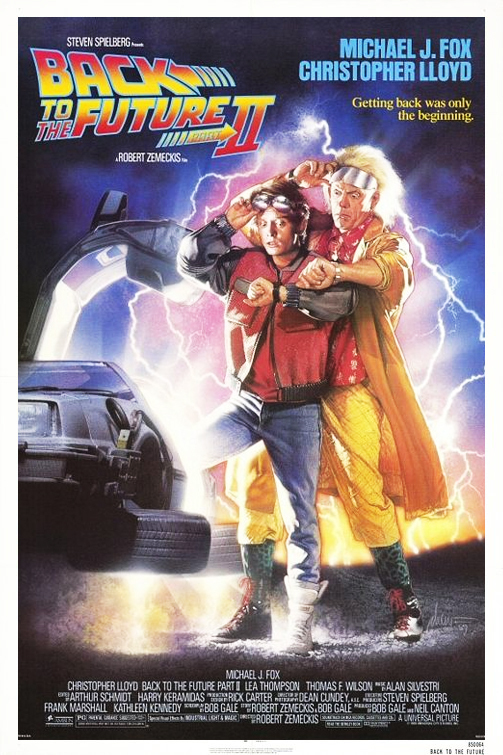 Now, not only does Marty have to acquire the Almanac from Biff, but he must do it while avoiding his other self or putting anything that happened in the last movie in danger. The technology used to blend the original and the sequel is stunning and makes this part of the movie completely believable. A movie works best with well-defined stakes,and that is apparent in the finale. 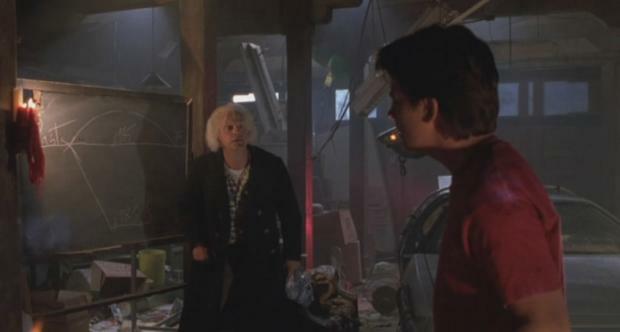 We know having seen the alternate 1985, that Marty desperately needs to destroy the Almanac to restore the proper timeline, so the entire third act is simply about Marty trying to steal a book. There are a lot of great suspense moments throughout like Marty trying to get it from under the nose of the principal, or Marty even being unintentionally screwed over by his past self. The climax with Marty chasing Biff with the hover board is fantastic and ends the only way it can, with Biff’s car ending up covered in manure again. The non-ending can be a problem for some, but I never really had a problem with it. The main plot of the film about Biff screwing up the timeline is concluded, so we’re left with the mystery of what happened to Doc. It’s more of a springboard into another story than a continuation of this one. I’ve always loved that they restaged Marty leaving the first time, and showing up behind a celebrating Doc moments later. It really excited me to see how the next movie would wrap it up. It is still the only movie I have seen that ends with a trailer for the next one. This movie still holds up in my opinion. The future stuff is corny, but it is imaginative and gets us to the rest of the movie, which is fantastic. I agree that the original Back to the Future is better made and more coherent, but I like the pure sci-fi craziness of the sequel more. The two movies lock together very well, and with the still good, but not as good third movie, form one of my favorite trilogies. 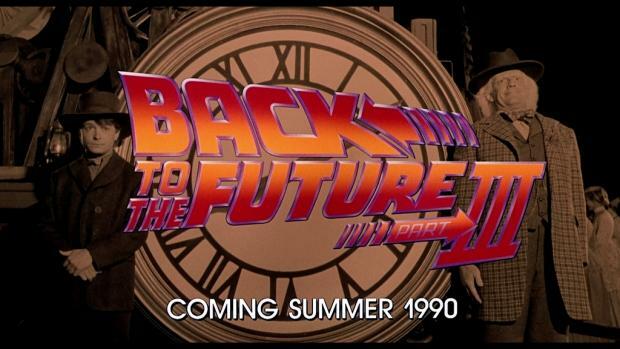 Back to the Future Part II is highly recommended.